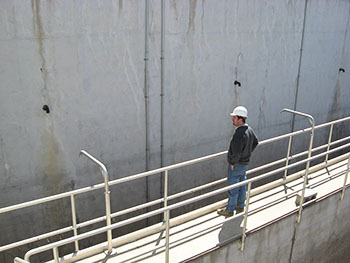 What can your consulting engineer do for you? Civil engineers are involved in the planning behind your everyday needs. Whether you are brushing your teeth, flushing the toilet, or driving across a bridge on your way to work, a civil engineer’s work affects these simple tasks many may take for granted. Consulting engineers provide independent expertise in engineering, products, regulations, and related areas to governments, utilities, industries, developers, and construction companies. Within a consulting engineering firm, civil engineering projects are usually handled by a team of engineers, designers, technicians, and administrative staff; the project manager is typically a licensed professional engineer. Often times when I need repairs done around my home, I first determine if I can fix the repairs myself or if I need to hire a professional to get the job done. This also holds true for a community when faced with old water mains, CSO issues, permitting requirements, etc. Finding the “right” professional for the job is key to a worry-free and successful project. We have included a few guidelines to assist you in determining if you need a professional engineer for your next community project. Projects are typically broken into several different phases, which consist of study, design, permitting, bid, and construction administration. Your consulting engineer can help you navigate through each of these phases, providing more information on funding, bid opening, inspection services, the preliminary engineering report, etc. Today’s civil projects often require a team of “in-house” experts along with professional consulting engineers. Look at the involvement of a consulting engineer as an opportunity to achieve a quality project from concept to completion. For in-depth details of each project phase and what you should expect from your consulting engineer, download our Engineering 101 Ebook.